This is a tiny little travel game box, barely bigger than a pack of playing cards, which stores everything you need except a pencil and paper to keep score (or a good memory) and is brilliant for taking on holiday or visiting friends or relatives. It's worth a mention that care has been taken over this packaging and you won't find yourself struggling to get the cards into the box - clever touches make a lot of difference. Inside the box you have the instructions, a buzzer card, 3 lost life cards, 5 double-sided spot prize cards and 70 question cards. 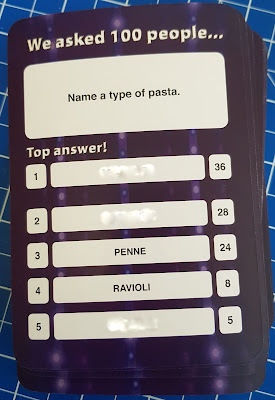 Question cards have 5 potential answers to the question, along with the number who picked them when 100 people were surveyed. You'll really only refer to the instructions in order to jog your memory, the game is just like on TV. There are 2 teams competing for the most popular given answers to a question. One full game is 3 x Single Money Rounds, 2 x Double Money Rounds, and 1 x Big Money Round. 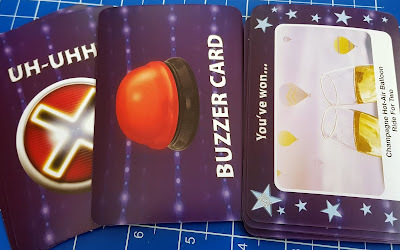 In a Single and Double Money Round teams nominate a player to buzz in and answer the question first, then decide to Play or Pass to the other team. Team mates then play in order until 3 x wrong answer buzzers have occurred, when play passes over to the other team to try to steal the round. I've obscured some answers so that I don't ruin the card for anyone with the game! In the Big Money Round teams nominate 1 player to write down a single answer to 5 x rapid fire questions. 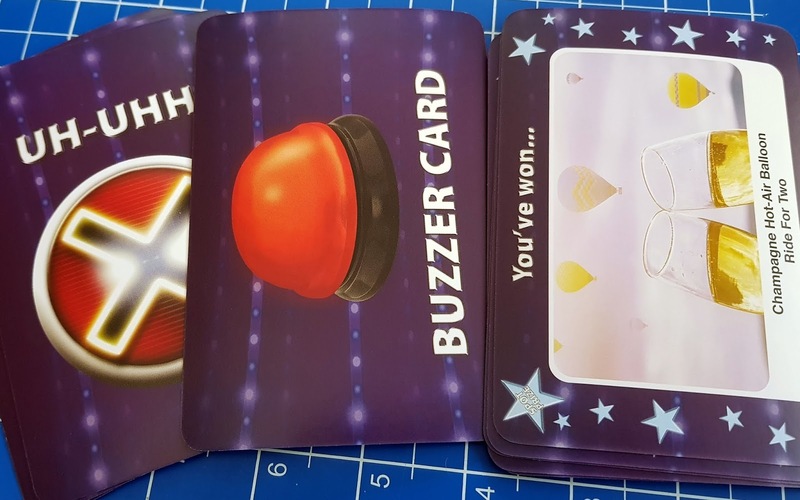 During the game there are special cards with answers that win spot prizes. This is an hilarious feature and really delighted anyone who won. It's not a even a real cruise, but still felt like a great win. The team who score the highest are the winners. Obviously, as in real life, the Big Money round is all-important, but unlike on the telly, both teams have a chance to grab the points. This is an excellent game. 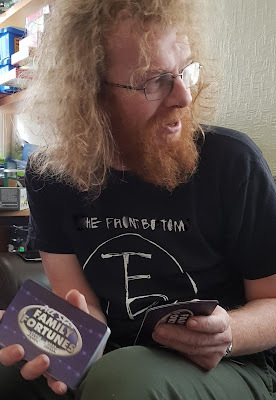 My 9 year old insisted on joining in, but he was never going to win purely because his experience of the world is more limited than an adult's is. The age recommendation is spot-on I'd say. 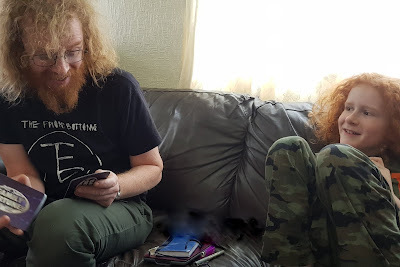 Even so, with 3 young boys all shouting out answers, they had plenty of fun. As a more adult game, with more correct answers, it makes for a lot of laughs, a little learning and a good evening. 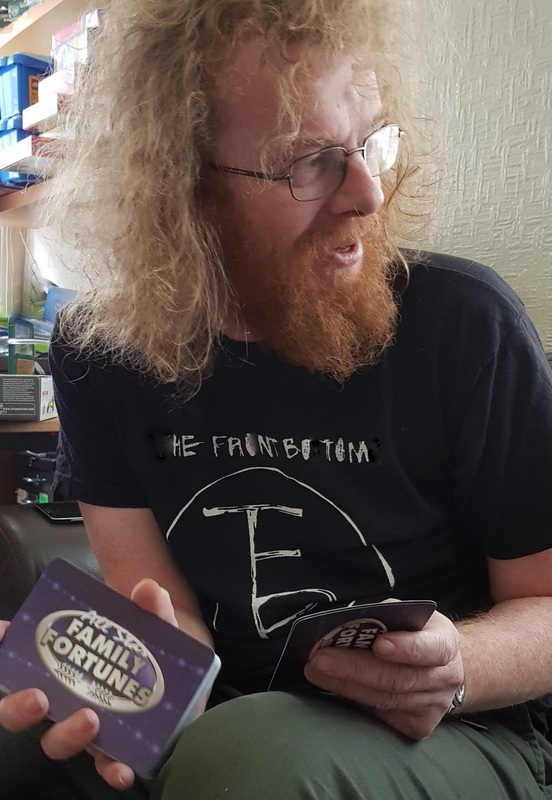 The mere fact you are playing Family Fortunes is funny enough "the survey said" and all the sound effects happen so naturally. You always have an answer to a question, but it's much harder than it seems on TV and incredibly funny at times. A brilliant party game, something anyone can join in with instantly. There are no tricky rules or complicated questions, just good fun. 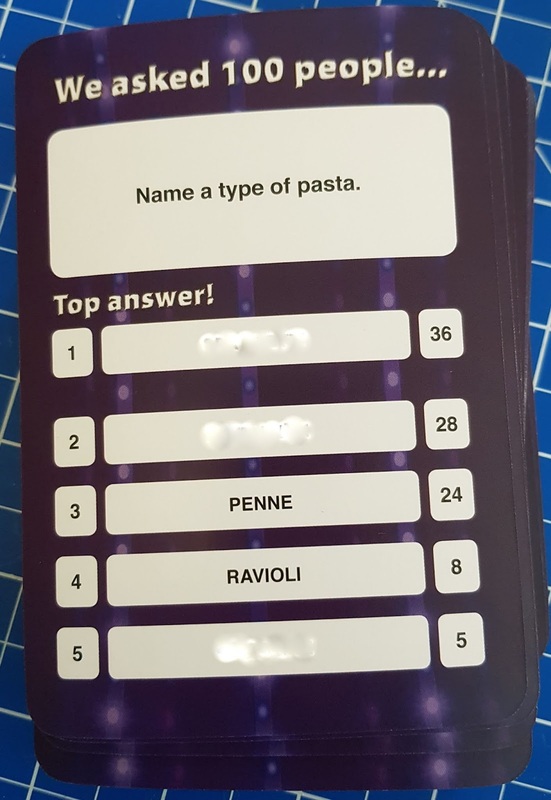 With 70 question cards it'll be a long time before you have learnt the most popular answers, so you can get a lot of play from such a small box. 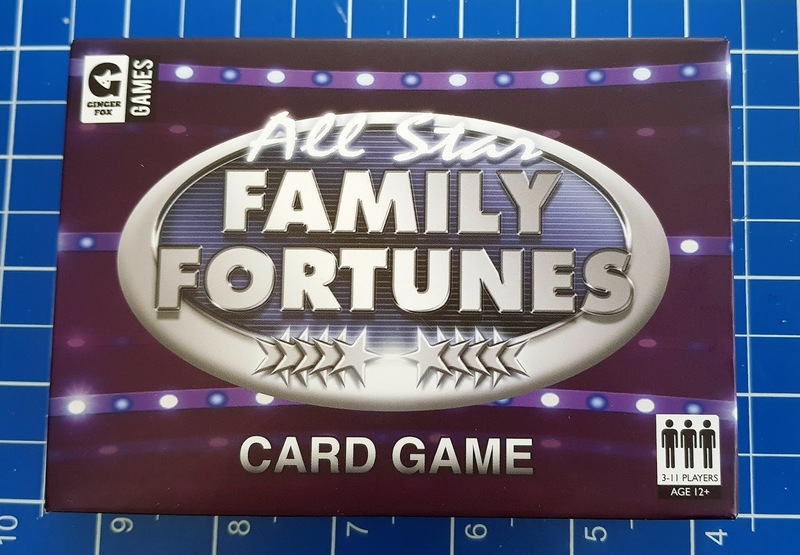 All Star Family Fortunes Card Game is from Ginger Fox Games and suitable for 3-11 players aged around 12+. Available now priced a very reasonable £7.30 from independent games stockists instore and online, including Amazon (affiliate*). 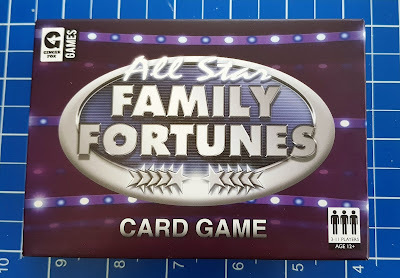 We were sent our copy of All Star Family Fortunes Card Game for review by Ginger Fox. Ooh this looks a good one for when we are holed up in our Premier Inns! Family Fortunes has definitely stood the test of time. It really has. I can't believe how long it's been going!! It's brilliant for taking away as it's so small and compact and there are no bits to lose!